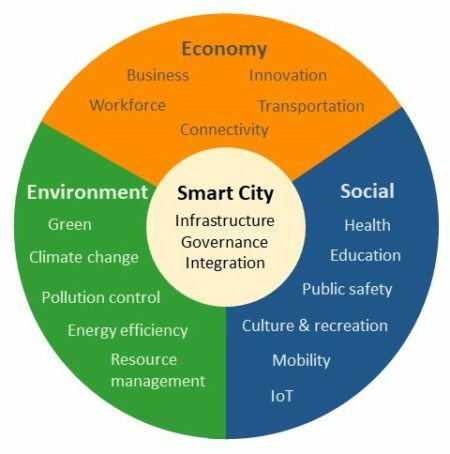 The Smart City | Strategic Networks Group, Inc. The term “smart city” was coined over 20 years ago and there are many definitions of what this means. The common theme across all definitions is that a smart city is an interconnected city that leverages the smart use of technologies to benefit its residents, businesses, and public service providers. Becoming an interconnected city is not just about connecting through technology, although technology is an enabler when smartly applied. It is about interconnecting the ecosystem of services and operations that are essential to the vitality of the community, including municipal departments as well as providers of services to the community, such as education, health, and social services. The “city” is at the center of the concept because it has an overall responsibility for the continued well-being and sustainable growth of the community, recognizing the interdependence among all stakeholders and citizens. The smart city concept does not imply that it is only for “cities”. In reality there are many examples where smart city concepts have been adopted by more than a single city, such as across a region that includes cities and towns. Smart city concepts are also used in areas that are not full-scale cities, such as towns, districts, and even neighborhoods. We use the term smart city to refer to the concept that can be applicable to communities of any size. Why does the smart city concept matter? Economic Sustainability – Providing citizens with the capacity to develop their economic potential and attract business and capital. Social Sustainability – A city’s attractiveness for people, business and capital is depends on how well it supports quality of life, social inclusiveness, business opportunities, and security and stability. Environmental Sustainability – Managing the availability and quality of environmental resources (water, air) and environmental impacts, generated by the city itself or caused by weather or geological events. Economic Development – The ability to retain and attract businesses and workforce in the face of global competition. Public Safety – Ensuring the safety and well-being of people and property as populations grow. Infrastructure – Strains on existing, and often aging, infrastructure to deliver the quality and capacity needed. Budgets – Managing growth with increasing pressures on budgets and sources of revenues. Energy and Environment – Increasing demands on resources and pressures on resource quality. Every community will feel some or all of these pressures in different ways. Smart city approaches can alleviate many of these challenges to ensure the continued livability and economic viability of the community while providing economies in the face of budget pressures. When it comes to smart city services, there are a few realities to recognize. First, it is important to recognize that while smart city services are implemented by the city for the benefit of its citizens, many of those services may not be overtly visible to those citizens, essentially operating behind the scenes. For example, most people take it for granted that the city ensures water quality and supply, provides effective public safety, manages waste collection, etc. The fact that the city uses smart city approaches to improve these services, and be more cost-efficient in doing so, will often go unnoticed by the majority. Nevertheless, the city can maintain livability and improve quality of life through such measures in the face of population growth and economic pressures. Secondly, a smart city collects information about its operations to better plan and manage public services for the benefit of the community. This may be invisible to community members, but essential to enable the effective delivery of smart city services. Smart devices and sensors that are interconnected and smartly placed throughout the city can measure and monitor conditions in real time. Some smart cities even enlist the population as voluntary “mobile sensors” through smartphone apps. There is a mass of data that needs to be collected, analyzed, and shared as needed requires a smart city ecosystem – this is why digital infrastructure is necessary as an enabling platform. Finally, there are smart city services that are much more directly visible to and impactful on people in their daily lives, such as improved waste management, more efficient public transportation, household or business energy management, improved health and education services, etc. Understanding the needs and issues of community stakeholders in these areas is foundational to prioritizing the deployment of such smart city services. Which services make sense for a city depends on addressing immediate needs or issues as well as meeting the city’s vision for the future. A smart city strategy inherently requires a holistic approach that prioritizes focus on specific needs while interconnecting solutions. This all must be approached with an understanding that the smart city whole is very much more than the sum of the technology parts. Read more about smart city services with some examples of what smart city can mean for you.